As a side bonus for fans of the franchise, purchasing this game unlocks an exclusive Power Sword weapon to use in the upcoming game: Warhammer 40,000: Space Marine. 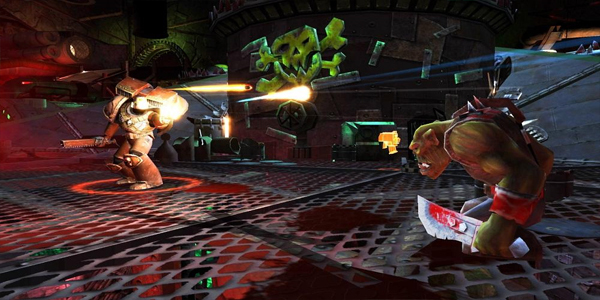 Multiple characters – You can play this game one of two ways, as a dual-stick shooter or as a hack-n-slash. There are four playable characters and each is unique, but it really boils down to a melee or a shooter class. Each character also comes with their own incredible unique special move, which adds even more options to fit your particular play style. You add in a friend for co-op and some nicely tuned combinations can be discovered. Great boss fights – There are a few boss fights that stand out through the campaign forcing players to search for creative ways to handle these confrontations. Your usual tactics won’t work when a boss appears and it helps progress gamers into more tactical players. And when you encounter the final boss for the last time, be prepared to put up the fight of your life. Precise pattern navigation and a calm demeanor are a must. Defeating the final boss in Warhammer 40,000: Kill Team brings back the feeling of achievement that can only be found in retro classics like Contra or Double Dragon. 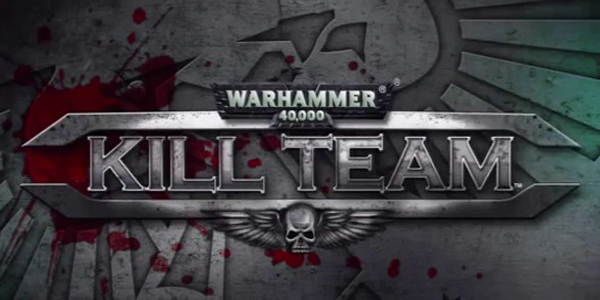 Voice acting – One of the first things you’ll notice while playing Warhammer 40,000: Kill Team is that voice acting is present and it’s done well. A lot of voice over work is included in this game and reading the amount of information being spoken would have really broken up the gameplay. Instead you hear clues like “take out the generators” right before you notice a generator glowing in the background. Great visuals and audio queues help keep a fast pace and also provide a great sense of direction. Upgrades – At first, the amount of upgrades given after completing the first level in Warhammer 40,000: Kill Team can be overwhelming. But given that certain upgrades really do best with certain classes, it’s really not all that complicated. Throughout your journey, you’ll unlock multiple weapons for each class, health upgrades, weapon upgrades and even upgrades for your special moves. The amount of customization for each class is a great addition that really allows players to find a perfect balance of offense and defense. Color palette – One glaring flaw in Warhammer 40,000: Kill Team is the lack of color in the environments. A very dingy gray, black and red color palette is used for most levels leaving the feeling that the whole campaign runs together as one giant level. This helps upgrades and power-ups stand out like a sore thumb, but a little bit of color would have gone a long way and it clearly shows. Odd camera angles – In certain situations, the camera really doesn’t adjust well. It’s rare but it’s impossible to ignore when it happens. Hugging walls tend to trigger these malfunctions the most. This is completely avoidable as hugging walls is fairly unnecessary. However a lot of the hidden collectables are tightly placed against walls. So if finding all of them is an objective of yours be prepared to deal with some poor camera angles. The wide camera angles also tend to take away from the level of detail with each character. 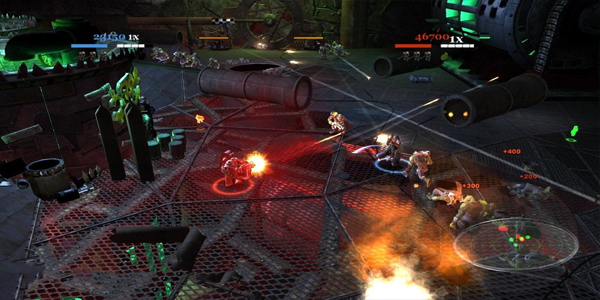 At times, a matrix-like sequence will cause the camera to zoom in and the gameplay to slow down for a brief moment. These sequences show incredible detail at a close range, but sadly, they are very rare. The majority of the game plays at such a wide angle that you rarely get to notice the finer details. The wrong enemy is the tough one – It seems odd, but the third enemy you encounter in Warhammer 40,000: Kill Team will pose the most difficulty. It’s a simple ork that shoots at you from a distance and refuses to engage in hand-to-hand combat. He shoots with the precision that the little flying saucers possess in Asteroids. While dozens of enemies engage in melee attacks, you are forced to deal with them while this particular ork stands at a distance and proceeds to cut down your life bar. This enemy literally poses more of a threat than most enemies in the game. You’ll even find him killing your character more than the last boss in the final showdown. His degree of difficulty seems extremely out of place given the way that the rest of the enemies scale in difficulty throughout the game. Local co-op only – This game is an incredible co-op experience. It’s really a shame that most gamers will never experience it. Who plays local co-op these days? Every day we as Xbox Live subscribers fill our friends list with friends and acquaintances that we intend to play games with. Why do developers continue to leave out the key element of online co-op? This is why we as gamers subscribe to the service that you as developers use to sell your game. Give us online co-op or don’t give us any co-op at all. Local co-op is only a slap in the face that reminds gamers that they’ll likely never use that feature. 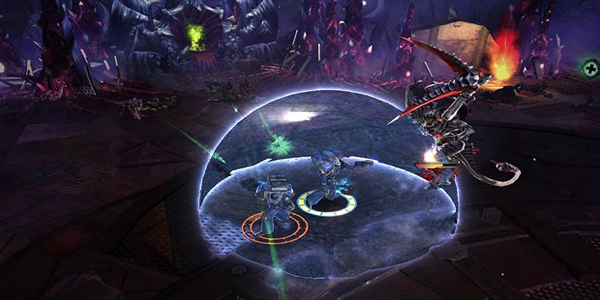 With these various gripes aside, Warhammer 40,000: Kill Team is still an excellent game. It may be short but the replay ability given with survival maps and multiple classes makes each playthrough seem like a completely unique experience. It’s one of the finer action games to hit XBLA in quite some time. This is a very solid game at a very reasonable price.